This brief video focuses on the importance of both precision and accuracy in geodetic surveying and the difference between them. 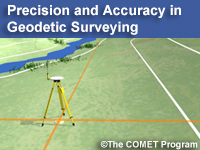 Produced in collaboration between NOAA’s National Geodetic Survey and The COMET Program, this video is aimed at surveying professionals, planners, policy-makers and others who use mapping products. The video emphasizes that the accuracy of survey measurements should always be verified by relating measurements to a known reference system such as the National Spatial Reference System in the United States. This resource is hosted on COMET's YouTube Channel. Recognize the importance of relating measurements to a known reference system such as the National Spatial Reference System in the US to achieve accuracy.